Environmental Health sanitarians inspect restaurants, grocery stores and other food service operations to ensure that food is being handled, stored and cooked properly. At home, you can use many of the same safety tips to ensure the food you prepare is safe for your family to eat. You can view our food service inspection reports online here. We were #1 in North America! Our Environmental Health Division received the 2013 Samuel J. Crumbine Consumer Protection Award. This prestigious award is given annually to local environmental health jurisdictions that demonstrate unsurpassed achievement in providing outstanding food protection services to their communities. Read our press release here. Watch the video on our YouTube page. It’s important to take all steps necessary to serve food that is safe for consumption. Review guidelines here. Never defrost food at room temperature. Cook food immediately after thawing. Do not partially cook, stop, then finish later. Remember to keep food out of The Danger Zone (most food should either be kept colder than 41 degrees Fahrenheit or hotter than 135º F). Place in refrigerator. Permit 24 hours per five pounds to thaw. Run under cold water. Permit 30 minutes per pound to thaw. Allow food particles to run off surface. Defrost in microwave. Thaw and transfer immediately to a preheated oven. Cook to thaw. Increase time and cook to recommended temperature. Use plastic/non-porous cutting boards. If using wood cutting boards, make sure they are made from a hard wood. Cook food to proper temperature. Test internal cooking temperatures with food thermometer. Sanitize thermometer before testing on different food. Hold cooked foods at 135º F.
Heat food quickly and thoroughly to 165º F.
Microwave leftovers carefully. Bacteria can survive in cold spots. Heat food evenly by covering, stirring, rotating and leaving covered two minutes before serving. Do not cool food on stove/counter before refrigerating. Refrigerate/freeze leftovers within two hours. Cool large amounts of leftovers in shallow pans/containers. Insert containers with cooked foods in ice baths. Add ice to foods not affected by additional water (soup/chili). Avoid packing the refrigerator. Circulating cool air keeps food safe. Whether you purchase your produce from the local grocery, a road side stand or grow it yourself, be sure to thoroughly wash all fruits and vegetables before adding them to your favorite soups, salads or eating raw. Produce often has been exposed to fertilizers, pesticides, bacteria and dirt. Always wash hands before handling produce. Clean sinks, strainers, scrub brushes and utensils before and after washing produce. Remove bad spots or blemishes that can contain bacteria/germs. Eliminate visible dirt with a scrub brush and running water, including cantaloupe and watermelons. Do not scrub delicate produce – grapes, strawberries, certain tomatoes. Rinse them longer and more thoroughly. Clean sinks, strainers, scrub brushes and utensils. Remove and discard outer layer of leafy vegetables (lettuce and cabbage). Rinse remaining leaves, individually under cool, running water. Peel skins, such as carrots and potatoes, then rinse. Never put produce in a bowl to soak. Soaking can allow contaminants to spread through food. Clean food under running water. Never return cleaned produce to its original container. Washing hands before handling foods; after each new activity in or away from the kitchen; and after touching hair, face or clothing. Storing raw foods below prepared foods in refrigerator/freezer. Sanitizing cutting boards, counters and utensils after contact with raw foods. An item/surface free of visible dirt may not be sanitary. Storing chemicals/cleaners away from food. Washing hands frequently and properly can reduce the risk of getting colds and communicable diseases. Wash hands after using the bathroom, playing with animals, sneezing or coughing, touching objects used by others, or exposure to a sick person. Avoid touching your eyes, nose and mouth. Wash in warm water, as warm as is comfortable. Use soap and lather well. Scrub hands thoroughly for 20 seconds (sing “Happy Birthday”), including wrists, back of hands, between fingers, under/around fingernails and rings. Rinse hands well; downward, from wrists to fingertips. Dry hands with a clean, dry towel or paper towel. Use towel to turn off faucet and open door. Sanitizing cutting boards, counters and utensils after contact with raw foods. An item/surface free of visible dirt may not be sanitary. Sanitizing utensils and work surfaces can prevent cross contamination and food borne illness. Clean surface/utensil with sanitizing solution (warm, soapy water, or one cap 5.25 percent chlorine bleach per gallon of water). Air dry or use clean, dry towel/paper towel. Handle clean dishes and utensils by edge/handle only. At home – Do not open refrigerator(s) or freezer(s). 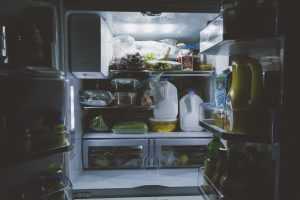 Without power, a combination refrigerator/freezer will keep food cool for short lengths of time, if left closed. Upright or chest freezers will keep food frozen for one to two days, depending on how full. At a restaurant, market, or other food service facility – stop serving food and close the facility. Call your local health department. Do not open refrigerator or freezer holding units. When power returns, check all food temperatures. If cold foods are above 41º F, or hot foods are below 135º F, discard immediately. Read our fact sheet on Food Safety During Power Outages and this Food Guide: When to Save and When to Throw it Out. Hamilton County Public Health is pleased to offer two levels of food safety training for food service and retail food operators. The trainings are available for anyone who wishes to learn proper food safety. Food Safety Application Registration and download a Spanish registration form here. Person In Charge Food Certification Course: The Person In Charge course, which is about 2.5 hours in length, is designed to cover the basic aspects of food safety including food sources, personal hygiene, and proper cooking and holding temperatures for food. The Person in Charge course is required for all new operations. All food service operations and retail food establishments, that opened after March 1, 2010, must have at least one person per shift that has attended the Person in Charge course or equivalent. Manager Food Certification Course: The Manager course is more extensive and encompasses two full days of training. The course offers food protection manager certification covering, in detail, microbiological concepts, HACCP, employee health, among other topics. All course materials are covered by registration costs. Please contact the Division of Environmental Health at 513-946-7800 if you have any questions regarding these opportunities. We are pleased to continue to serve the public through education of food workers throughout Hamilton County. Beginning in 2019, Person In Charge courses will be offered once a month. Please check the calendar for times and dates. Manager ServSafe courses are from 8 a.m.-5 p.m. on their scheduled days with the test in the afternoon on the second day of the course. You may download a flyer with dates and more information for 2019 – or you can download the calendar dates only: 2019. All state and local food codes in the United States are modeled on the FDA Food Code. Read CDC’s full journal article this content is based on. View CDC’s printable fact sheet version of this page.